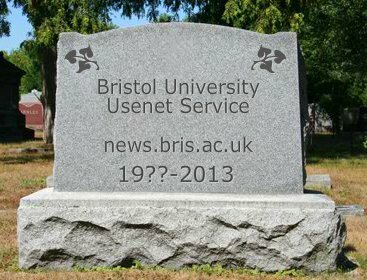 The University of Bristol has had a Usenet service for over 25 years, and it’s finally time for our Eternal September to end. The service is set to be switched off on 28th August 2013. Working out exactly how long Bristol has had a Usenet service for isn’t all that easy as most of the people involved in the early days aren’t at Bristol any more. The earliest posting I’ve found so far  is from 3rd March 1988, which came via a machine in Computer Science. Does this mean Bristol first got access to Usenet in 1988? I’m not sure. I think it’s likely that before 1988 messages were posted from Bristol via UUCP (as messages from 1986 exist, posted via UUCP from Bath and it’s probably reasonable to assume that Bristol were doing similar things at the time) but without knowing the naming/addressing scheme in use they’re not going to be easy to find. In 1998, the University of Bath needed to replace the hardware running their own usenet service, and shortly after the hardware in use at Bristol was also due for renewal. Paul Smee suggested sharing service between Bristol and Bath, Bath agreed and have been running news.bris.ac.uk for us ever since. In 2010, Janet retired the national Usenet peering service which Bath were using to keep the server supplied with articles. Bath restructured the service to peer directly with 7 other institutions around the world and kept it going. Here we are over 25 years later, and Bath have decided that usage of the service has dwindled to the point that it’s not worth keeping it going. In the last 3 months of the service only 9 machines at Bristol have connected to it to read news. Given that we’ve got more machines than that in my office alone (and I’m responsible for one of the machines on the list from Bath! ), I’m inclined to agree with them. I’ll personally be sad to see it go. I’ve been on Usenet since 1995 – and was actually introduced to it (and email) before the Web. I’ve met some of my best friends on Usenet and although the groups I follow have reduced in traffic significantly over the last couple of years (from 40+ posts a day to 10-15 posts a day) I can’t give up my news habit completely and I’m looking for a new (free!) server. Internet archaeology isn’t easy, and I’m pretty confident that earlier usenet postings from Bristol exist. Google Groups has an “advanced search” option which allows you to search their archive back as far as 1981. If you can find a message from before 3rd March 1988, go into the “more message actions” dropdown list (top right of the message) and select “Show original” – either slap the URL of the resulting page in the comments for this page, or post the contents of the Message-ID: line.